Q. Is PINKarate a franchise? Are there other locations? A. At this time, no. We always love to get emails from people all over the world who think PINKarate would make a great franchise. Eventually, we may do that, or make it a licensing agreement and have instructor training certifications. If you are a skilled female martial artist, and have the vision and passion to empower girls, please email us and let's here your ideas! Q. I live in another state. How can I get one of those Pink Gis for my daughter? A. 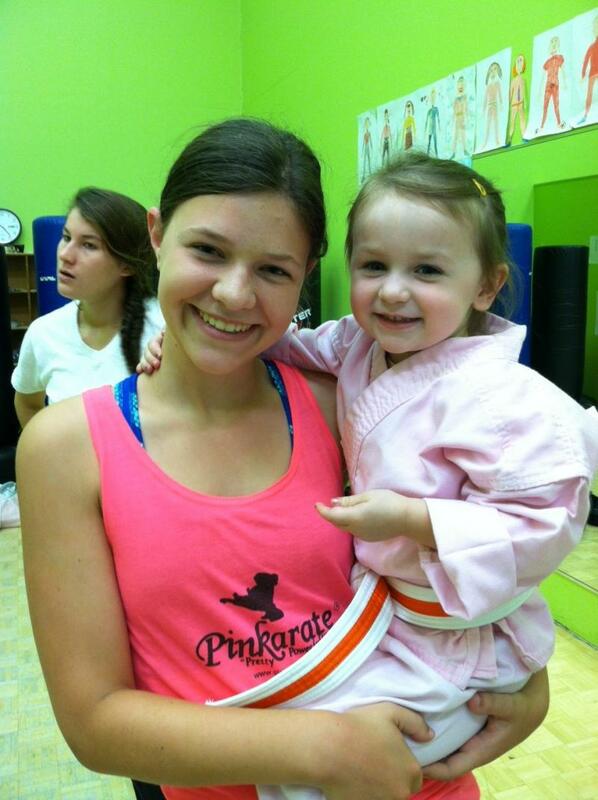 We love our pink gis, too! We invented them! However, our uniform has our trademarked Logo on the back, so only PINKarate students can purchase them. If you'd like one without the Logo, email us and let's talk! Perhaps your school would like to start a PINK Program! Q. Is PINKarate a real martial art? A. No, PINKarate is the name of the program. Our style is American Kenpo Karate, which teaches real-life self defense concepts. Miss Liz trained under Master Dennis Nackord, who brought Kenpo Karate to the east coast. He was a student of the Founder of American Kenpo Karate, Ed Parker. Miss Liz is also proud to have been a student of World Champion Kickboxer Joe Lewis, who saddly lost his battle with cancer. Q. What's the youngest age a girl can start PINKarate? A. We like to say "4 and up," however, no two girls are alike. So, if you think your daughter is ready at 3 1/2, you're welcome to try it. Remember, at this age, it's not about kicking and punching, it's about learning how to be safe! Q. I see that Bobbi Brown Cosmetics is using the "Pretty Powerful" slogan in all its advertising campaigns. Did you get that from her? A.GREAT question! Actually, they may have gotten it from us! Miss Liz came up with the "Pretty Powerful" slogan 10 years ago, as seen in all her old press. We're flattered that Bobbi Brown has taken it to empower more women, but our girls are the original "Pretty Powerful." Sorry, Bobbi. Copyright 2019 PINKarate. All rights reserved.